Aims: The aim of this study was to assess oxidative stress (OS) caused by tobacco habits in the initiation and progression of periodontitis by evaluating the salivary uric acid (UA) and albumin (ALB) levels, which are indicators of antioxidant activity, and to compare their values with normal and healthy individuals with no tobacco habits. 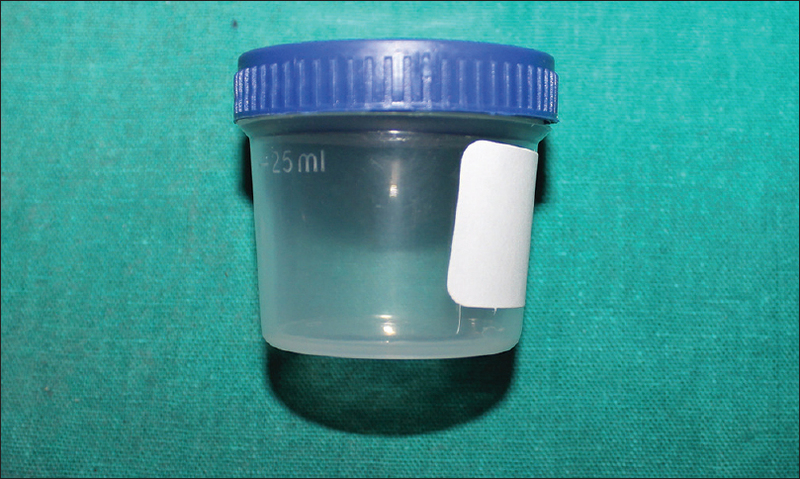 Settings and Design: A total of 75 subjects were divided into three study groups and were asked to collect unstimulated whole saliva in sterile plastic containers. Subjects and Methods: Groups A, B, and C comprised 25 subjects each, according to their respective inclusion and exclusion criteria. Subjects from all the three groups were asked to collect unstimulated whole saliva in sterile plastic containers, which were then sent for laboratory assessment of UA and ALB levels to determine the levels of OS in the saliva samples of each subject. Statistical Analysis Used: Independent student's t-test was used for statistical evaluation of the results of the present study. Results: Levels of salivary AOs, UA, and ALB were remarkably reduced in subjects having periodontitis, thereby exhibiting higher levels of OS. The levels of these AOs were further reduced with the use of tobacco in subjects already diagnosed with periodontitis. Conclusions: Significant OS occurs in periodontitis with tobacco being a probable risk factor. Thus, saliva can be used as a noninvasive diagnostic fluid with UA and ALB being promising biomarkers in monitoring periodontal disease and OS. The oral cavity holds many great secrets which are reflected purely in its appearance and function. Saliva is one of the most complex, versatile, and important body fluids, fulfilling a large range of physiological needs. The use of saliva as a diagnostic fluid is a relatively recent trend. Oral fluid, often called the mirror of the body's health, is a perfect medium to be explored for health and disease surveillance. The use of saliva as a diagnostic tool presents many advantages: it is easy to collect using a noninvasive technique which can be performed at home, and no special equipment is needed for collection. From children to adults, saliva can be used as a diagnostic fluid as its collection is associated with fewer compliance problems compared with blood collection. Periodontitis is among the most widespread inflammatory chronic condition which affects oral cavity. It is an inflammatory disorder in which tissue damage occurs due to complex interactions between periodontal pathogens and components of the host defense mechanism. It has been observed that invading Porphyromonas gingivalis bacteria trigger the release of cytokines, such as IL-8 and TNFα, leading to elevated numbers and activity of polymorphonucleocytes (PMN). As a result of stimulation by bacterial antigens, PMN produce the reactive oxygen species (ROS) superoxide via the respiratory burst as part of the host response to infection. Patients with periodontal disease display increased PMN number and activity. It has been suggested that this proliferation results in a high degree of ROS release, culminating in heightened oxidative damage to gingival tissue, periodontal ligament, and alveolar bone. Oxidative stress (OS) represents an imbalance between the production of highly reactive molecular species or reactive oxygen species, reactive nitrogen species (RNS), and antioxidant defense systems. Tobacco use is known as one of the most important risk factors for oral diseases such as oral cancer and periodontal disease by evoking OS and antioxidant activity in susceptible individuals. Saliva, being the first biological fluid met by external ingested substances such as food, drinks, inhaled volatile cigarette smoke (CS), microorganisms, etc., is the first line of defense against OS through its antioxidant activity. An antioxidant is any substance that, when present at low concentrations compared to those of an oxidizable substrate, significantly delays or prevents oxidation of that substrate. Saliva is rich in antioxidants such as uric acid, albumin, ascorbate, and enzymes, which constitute the antioxidant potential of saliva. Uric acid appears to be the dominant antioxidant present in saliva and displays a concentration similar to that of serum. It is a major salivary antioxidant, levels of which decrease in periodontitis. Other salivary antioxidants include ascorbic acid and albumin, but concentrations of these are lower than that of serum. Research studies have demonstrated reduced salivary antioxidant activity in patients suffering from periodontal disease. It has been previously shown that saliva can be used for measurement of markers of OS that seem to be associated with local oral conditions. Thus, the aim of this study is to establish the diagnostic potential of saliva in predicting the OS caused by tobacco habits in the initiation and progression of periodontitis by evaluating the salivary uric acid and albumin levels, which are indicators of antioxidant activity, and to compare their values with normal and healthy individuals with no tobacco habits. A total of 75 individuals, above 18 years of age and divided into three groups of 25 subjects each who were randomly selected from the pool of patients visiting the Department of Oral Medicine and Radiology, were enrolled in the study after fulfilment of the inclusion and exclusion criteria. All subjects above 18 years of age. Group A – Patients diagnosed with periodontitis with no tobacco-related habits. Group B – Patients diagnosed with periodontitis having tobacco-related habits (both smoke and smokeless form). Group C – Patients with a healthy periodontium and no tobacco habits. Voluntary written informed consent was obtained from all the study subjects after explaining the purpose and procedure of the study. Exclusion criteria included subjects with history of any known systemic disease, e.g., disorders that could pose a risk for periodontitis such as diabetes mellitus, metabolic disorders, hematological disorders, nutritional disorders, etc., subjects who were under regular medications for any systemic diseases, patients with a past history of periodontal therapy, patients with a history of dental or maxillofacial trauma, patients suffering from trauma from occlusion, patients with deleterious parafunctional habits, patients with maligned teeth, and pregnant women. Each patient was informed about the procedure and technique, and his/her consent was obtained. This was followed by the assessment of the periodontal status using the Russell's periodontal index, and a panoramic radiograph was obtained. Radiographs were taken according to the specifications of the Panoramic Machine (Kodac 8000C), which has a constant magnification of 1.14 ± 10%, following the ALARA principle. After arriving at a clinical diagnosis, in accordance with the scores of the Russell's periodontal index, the individuals were assigned to study groups A and B. Individuals who were healthy without any tobacco habits and absence of periodontitis formed Group C.
All subjects were then verbally provided with the necessary instructions for saliva collection. Five milliliter of unstimulated whole expectorated saliva from each subject was collected into sterile containers after a single mouth rinse with 15.0 ml of water to wash exfoliated cells [Figure 1]. 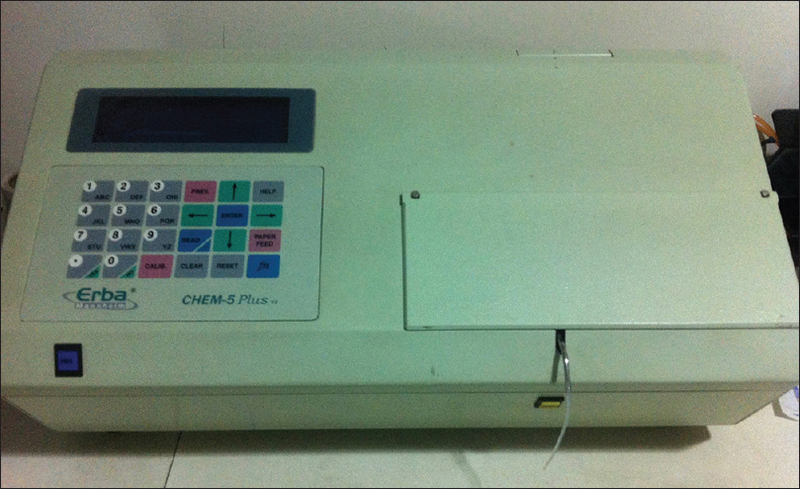 Collected samples were then subjected to laboratory analysis of uric acid and albumin levels using Chem 5 Plus V2 (Erba) automated saliva analyzer [Figure 2]. On obtaining the values of salivary uric acid and albumin for each subject in all the three groups, a record was made in the master chart. A record of the age, gender (for groups A, B, and C), and level of periodontitis (for groups A and B) was also made. Data collected was entered into a spreadsheet computer programme (Excel 2010; Microsoft, US). Independent Student's t-test was used for statistical evaluation of the collected data. On testing each variable of OS, i.e., uric acid and albumin, with respect to all the three groups, a P- value of less than 0.05 was considered indicative of statistically significant correlation of the variables with respect to the particular group being assessed. Hence, in the present study, on testing each variable of OS, i.e., uric acid and albumin, with respect to all the three groups, a P- value of less than 0.05 was considered statistically significant correlation of the variables with respect to the particular group being assessed. This study comprised a total of 75 subjects, of which 32 (42.66%) were females and 43 (57.33%) were males. The average age for subjects in group A, group B, and group C were 34.32, 33.32, and 30.68, respectively. Levels of uric acid, the major salivary antioxidant, responsible for 85% of the total antioxidant capacity, were significantly decreased in patients diagnosed with periodontitis as compared to controls (group C) [Table 1] and [Graph 1], with a P- value of <0.05. The present study also found that salivary uric acid levels in patients having tobacco habits with periodontitis was significantly reduced compared to patients diagnosed with periodontitis but not having any tobacco habits (P-value < 0.01). 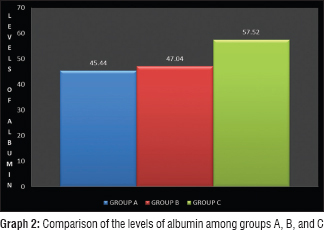 In this study, the levels of albumin were significantly reduced in group A and group B subjects compared to the controls, i.e., Group C. However, the levels of albumin did not show statistically significant results between subjects diagnosed with periodontitis of group A and subjects having tobacco habits with periodontitis of group B [Table 2] and [Graph 2]. In the present study, the subjects in group A who were diagnosed with periodontitis and those in group B who were having tobacco habits along with the presence of periodontitis were further subdivided into subjects having beginning periodontal status, subjects with established periodontal disease status, and subjects with a terminal status of the periodontal disease, based on the scores of Russell's periodontal index. 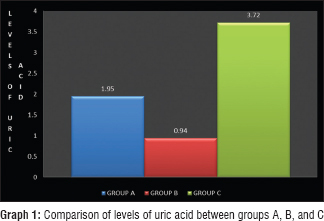 In this intragroup comparison, an attempt was made to determine differences in the levels of uric acid and albumin between the three subgroups. Among the subjects of group A, no statistically significant difference was found between the three subgroups. However, a lowest mean value of 1.846 for uric acid was found in subjects having terminal periodontal disease, indicating reduction in the major antioxidant of saliva as the periodontal disease progresses. Levels of albumin had, however, significantly reduced from subjects having beginning periodontal disease to subjects having established periodontal disease, which was statistically significant (P-value < 0.05). In subjects of group B, results revealed statistically significant reduction in the levels of uric acid among those having established periodontal disease than those having terminal periodontal disease with tobacco habits (P-value < 0.01). Similarly, the levels of albumin in the saliva of subjects having terminal periodontal disease were low as compared to subjects having beginning periodontal disease with an average of 42.375. These results were statistically significant (P-value < 0.05). Further, intergroup comparison of the levels of UA and ALB of the three subgroups was done between groups A and B. [Table 3] and [Graph 3 show the levels of uric acid and albumin in saliva of all the three subgroups of periodontal disease between groups A and B. 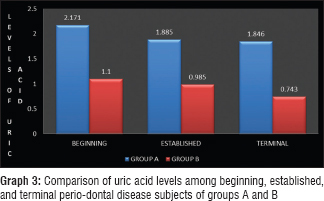 In this intergroup comparison, levels of salivary uric acid in all the three grades of periodontal disease in group B were significantly reduced compared to group A. In this study, a greater preponderance was found for males. Males exhibited lower levels of salivary uric acid compared to females, which was statistically significant (P-value < 0.05). Similarly, levels of albumin in males were found to be low compared to females, however, these results were not statistically significant. Saliva is an interesting diagnostic fluid not only due to noninvasive sampling but also due to changes in saliva composition caused by pathological processes. It has been previously shown that saliva can be used for measurement of markers of OS that seem to be associated with local oral conditions. OS is an imbalance between the production of free radicals and antioxidative status representing a widespread phenomenon involved in the pathogenesis of inflammatory diseases and cancer. Local oral pathologies and systemic diseases such as periodontitis, oral carcinoma, aphthous stomatitis, and diabetes mellitus are associated with an increase of OS markers in saliva, which has been proved by various studies. Antioxidants are present in all body fluids and tissues that protect against endogenously formed free radicals. They scavenge FR or ROS and prevent the damage caused by them. Free radicals are normally neutralized by efficient systems in the body that include antioxidant enzymes (superoxide dismutase, catalase, and glutathione peroxidase), as well as the nutrient-derived antioxidant small molecules (vitamin E, vitamin C, carotenes, flavonoids, glutathione, and uric acid). In apparently healthy individuals, a delicate balance exists between free radicals and antioxidants. Many studies have shown that disruption of relations of free radicals and antioxidants play an important role in the pathogenesis of inflammatory diseases of oral tissues. Periodontal diseases are inflammatory diseases that have a multifactorial etiology. The inflammatory and immune responses to the bacteria as well as viruses that colonize the periodontal and associated tissues involve the systemic circulation and ultimately the peripheral systems of the body. 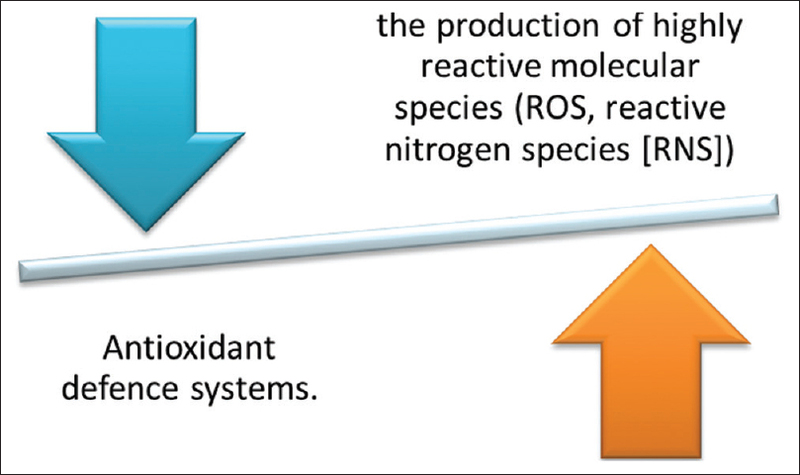 Loss of balance between reactive oxygen species and antioxidant defense has also been implicated as an etiologic factor for periodontal diseases [Figure 3]. It may manifest as an increase in oxidative stress, reduction of total antioxidant capacity, or decrease in individual antioxidant level. Increased generation of ROS may cause toxic effects by oxidative damage of proteins, lipids and DNA. Oxidative damage of these biomolecules contributes to disease development. OS in periodontitis expressed by elevated concentrations of ROS and accompanied by suppressed antioxidant activity in saliva and blood may accelerate progression of periodontal disease. The present study was conducted to evaluate OS in periodontitis by measuring the levels of antioxidants, i.e., uric acid and albumin and the correlation of tobacco-habits with periodontitis and OS in saliva. There is increasing evidence that OS is an important contributing factor in the pathogenesis of periodontal disease. In accordance with the present study, Chapple implicated OS in the pathogenesis of periodontitis. Abdolsamadi et al. also implicated that tobacco use is one of the most important risk factors for oral diseases such as oral cancer and periodontal disease by evoking OS and antioxidant activity in susceptible individuals. In the present study, levels of salivary uric acid and albumin were significantly decreased in patients diagnosed with periodontitis compared to individuals with an apparently healthy periodontium. Novaković et al. conducted a study which also showed decrease in the levels of uric acid and albumin in patients with chronic periodontitis compared to healthy individuals. This is in accordance with the findings of Shetty and Talaviya. In 2011, Mathur et al. conducted a study to investigate effect of antioxidant therapy on the progression of periodontal disease and to investigate if any correlation exists between antioxidant levels in saliva and periodontal attachment loss and they found that uric acid levels were low in patients with more periodontal attachment loss. In the present study, we found that subjects with the worst periodontal health status and tobacco habits tended to have greater oxidative injury and lower levels of uric acid compared to subjects with only periodontal disease but no tobacco habits. This is in accordance with the findings of Buduneli, who stated that smoking is the second strongest modifiable risk factor for periodontal disease after microbial dental plaque. Albumin is a protein with antioxidant properties, and in the present study this molecule was not sensitive for tobacco users but can be considered a good marker for periodontitis. The little increase of albumin in the case of tobacco users may represent a compensatory antioxidant defense system to counteract OS because the level of the principal antioxidant, uric acid, is very low. According to Greabu et al. (2012), albumin is considered a sacrifice antioxidant. The present study is in accordance with these findings. In the present study, saliva was used as a diagnostic fluid because it can be collected in a safe and easy manner requiring no special training and whole saliva is a mixture of oral fluids and includes secretions of the major and minor salivary glands in addition to constituents of non-salivary origin derived from GCF, expectorated bronchial secretions, serum and blood cells from oral wounds, as well as bacteria and bacterial products, viruses and fungi, desquamated epithelial cells, and food debris. This is in accordance with the findings of Chiappin et al. and Mathur et al. A study by Sculley et al. also suggested that whole saliva may contain simply measured indicators of oxidative processes and may provide a tool for the development and monitoring of new treatment strategies. Thus, it can be proposed that, in the future, antioxidant supplementation may be used in the treatment or prevention of periodontitis. Hence, investigating OS will not only be useful in clarifying the pathogenic mechanisms of this relationship but also focus on therapeutic approaches. It is almost certain that, in the very near future, the whole spectrum of salivary screening would be evolved because it is an upcoming area of research for basic and clinical application purposes, with considerable potential for growth and progress. Due to the many potential limitations of salivary diagnosis, promising results from interventional studies in well-controlled trials must be obtained to clarify these results. While many questions remain, the potential advantages of salivary analysis for the diagnosis of various diseases suggest that further studies are warranted. Consequently, we are likely to see increased utilization of saliva as a diagnostic fluid. As a result, dentists will have a greater involvement in the identification and monitoring of various disorders. Navalkar A, Bhoweer A. Alterations in whole saliva constituents in patients with diabetes mellitus and periodontal disease. J Indian Acad Oral Med Radiol 2011;23:498-501. Lima DP, Diniz DG, Moimaz SA, Sumida DH, Okamoto AC. Saliva: Reflection of the body. Int J Infect Dis 2010;14:e184-8. Greabu M, Didilescu A, Puiu L, Miricescu D, Totan A. Salivary antioxidant biomarkers in non-ferrous metals mine workers – A pilot study. J Oral Pathol Med 2012;41:490-3. Mathur A, Mathur L, Manohar B, Shankarapillai R, Mathur H. Effect of antioxidants on progression of periodontal disease. Int J Dent Clin 2011;3:13-5. Sculley DV, Langley-Evans SC. Salivary antioxidants and periodontal disease status. Proc Nutr Soc 2002;61:137-43. Lakshmi Sree S, Mythili R. Antioxidants in periodontal diseases: A review. Indian J Multidiscip Dent 2011;1:140-6. Shetty M, Talaviya D. Determination of salivary uric acid levels in periodontitis and health: A case control study. Nitte Univ J Health Sci 2012;2:54-6. Vlková B, Stanko P, Minárik G, Tóthová L, Szemes T, Baňasová L, et al. Salivary markers of oxidative stress in patients with oral premalignant lesions. Arch Oral Biol 2012;57:1651-6. Novaković N, Cakić S, Todorović T, Raicević BA, Dozić I, Petrović V, et al. Antioxidative status of saliva before and after non-surgical periodontal treatment. Srp Arh Celok Lek 2013;141:163-8. Mathur A, Mathur L, Manohar B, Mathur H, Shankarapillai R, Shetty N, et al. Antioxidant therapy as monotherapy or as an adjunct to treatment of periodontal diseases. J Indian Soc Periodontol 2013;17:21-4. Nurcan Buduneli (2012). Effects of Tobacco Smoking on Chronic Periodontitis and Periodontal Treatment, Pathogenesis and Treatment of Periodontitis, Prof. Nurcan Buduneli (Ed. ), ISBN: 978-953-307-924-0, InTech, Available from: http://www.intechopen.com/books/pathogenesis-and-treatment-of-periodontitis/effects-of-tobacco-smoking-on-chronic-periodontitis-and-periodontal- treatment. Sculley DV, Langley-Evans SC. Periodontal disease is associated with lower antioxidant capacity in whole saliva and evidence of increased protein oxidation. Clin Sci (Lond) 2003;105:167-72.